Not Pictured: S/Sgt Jack D. Ferguson (TG-POW)(3) who replaced Wallrobenstein. (KIA-POW-EVD) On 29 Jan 1944 on mission #101 to Frankfurt, Germany in B-17 #42-39786 GI Sheets (427BS) GN-R. The crew crossed the German coast with a faulty #2 engine and was forced to feather the #4 engine just before reaching the IP, when it developed a bad oil leak. 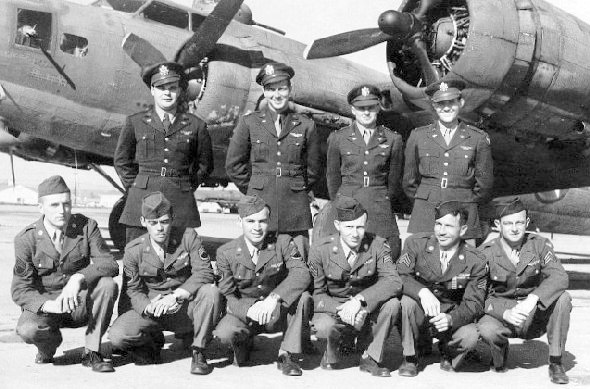 Bombs were jettisoned when the B-17 was unable to keep up with the formation. It was soon hit by German FW-190 fighters that disabled the oxygen system, interphone and many flight instruments. Lt Fowler belly landed his B-17 in a field at Soire-Saint Gery, Belgium. 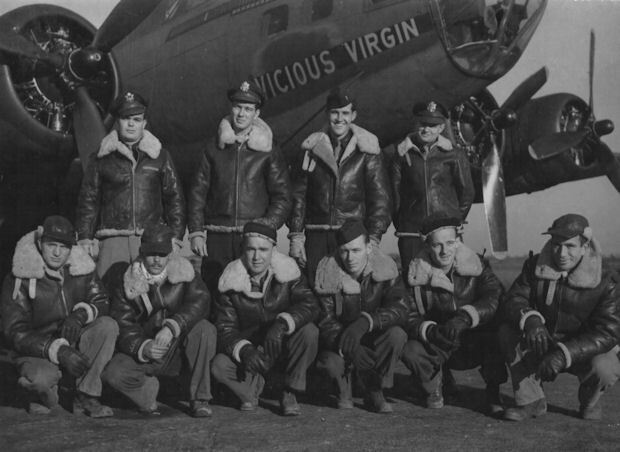 All crewmen, except Lt Fowler and Lt Rawlings, were wounded. Fowler (P) & Dinwiddie (R) - Evaded capture until 13 May 44 when they were betrayed by a French doctor and his wife who drove them to a German outpost. Taylor (N), Thompson (B) & Ferguson (TG) - Badly wounded. Taken to a civilian hospital by Belgiums where they were made POW and cared for a Germans. Finley (E) Evaded with Rawlings. Captured not far from the Spanish border after they split up. Arrington (BT) & Zimmer (RWG) - Evaded Capture. Picked up by American troops.in September 1944. Back to England on 08 Sept 44. Jackson (LWG) - Died from severe wounds after the crash landing. Had taken off his flak vest in flight. Zimmer (RWG) - Bailed out at about 150-200 ft altitude and landed in a bog.